Ashe won the 1968 US Open men's singles title. Arthur Ashe was inducted into the Court of Champions in 2009. 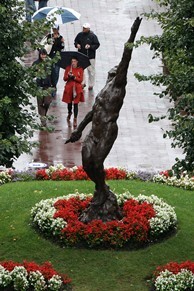 A statue was erected in Ashe's honor at the USTA Billie Jean King National Tennis Center. 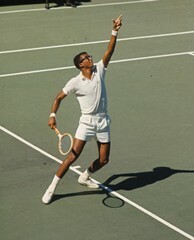 For more information on Arthur Ashe and his legacy, please visit the Arthur Ashe Learning Center and www.arthurashe.org. Presented by Hess and produced by the USTA, Arthur Ashe Kids’ Day benefits the National Junior Tennis and Learning (NJTL) network. The NJTL was established by Arthur Ashe, Charlie Pasarell and Sheridan Snyder in 1969 with the mission of developing the character of young people through tennis and education. Since then, the NJTL network has grown to include over 550 chapters which serve over 220,000 youth annually. NJTL chapters, which vary in size and scope, can be found in 46 of the top 50 U.S. markets, making NJTL one of the USTA’s largest community-based initiatives. NJTL chapters are supported by the USTA through grants, awards and various learning opportunities. NJTL participants have the opportunity to take part in a number of core programs, including the Tennis and Leadership Camp, the Arthur Ashe Essay and Art Contest, Arthur Ashe Kids’ Day, Regional Rallies, a scholarship to the annual USTA Community Tennis Development Workshop and low-cost insurance. Arthur Ashe was born on July 10, 1943 in Richmond, Virginia and is remembered for his excellence as a tennis player as well as his efforts to further social causes. He remains the only African American player ever to win the men’s singles title at Wimbledon, the Australian Open or the US Open. His legacy continues to have a positive effect on our society. 1969 Co-founded the NJTL (National Junior Tennis League). He envisioned NJTL "as a way to gain and hold the attention of young people in the inner cities and other poor environments so that we can teach them about matters more important than tennis." Joined U.S. Army from 1966 to 1968, and rose to the rank of Second Lieutenant. Key figure behind the formation of the ATP (Association of Tennis Professionals). Captain of the U.S. Davis Cup Team from 1981 through 1985 (the U.S. won the Davis Cup in 1981 and 1982). Member of a delegation of 31 prominent African Americans who visited South Africa to observe political change in the country as it approached racial integration and the end of apartheid. Founded the Arthur Ashe Foundation for the Defeat of AIDS to raise money to prevent, treat, and cure AIDS, with an end goal of eradicating the disease. For more information on Arthur Ashe and his legacy, please visit the Arthur Ashe Learning Center and arthurashe.org. Elected into the International Tennis Hall of Fame in 1985.